Use a Sierra Cup for boiling water, cooking, purifying water*, or simply drinking out of. There are two sizes available, the standard 1-cup version (8oz) or the jumbo 1 3/4-cup (14oz). 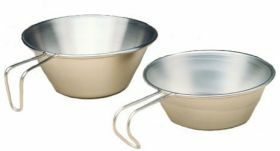 Both Sierra Cups are made of durable stainless steel with a heavy gauge wire handle. Great for camping or placing in your survival kit. When you're in the wild, camping or in a survival situation, having something to put water in is a necessity. Finding a source of water but not having anything to carry it to the fire with would be extremely frustrating. With a sierra cup, you're all set. You'll also be able to cook or make tea.